Born in Delaware in 1807 to a Quaker family, Elizabeth Chandler was orphaned at an early age and raised by relatives in Philadelphia. She was educated at a Quaker school there, and developed a talent for writing, which she put to use promoting the abolitionist cause. 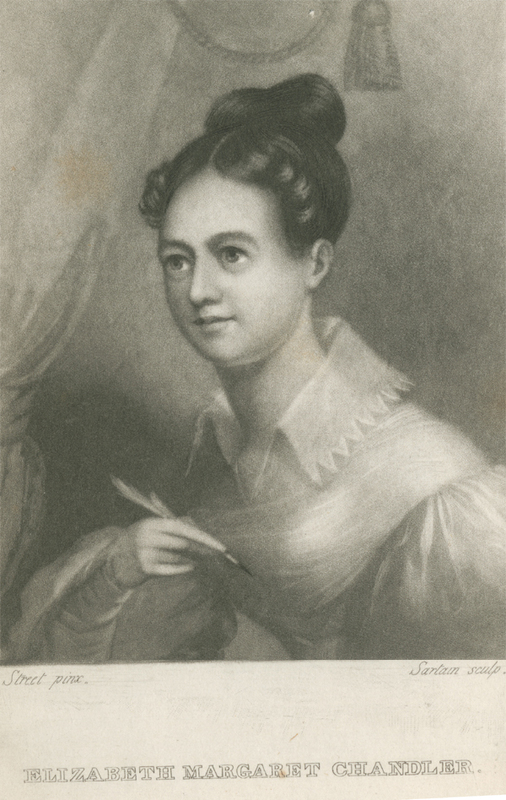 In 1825, Elizabeth Chandler wrote a prize-winning poem called “The Slave Ship,” which caught the eye of Benjamin Lundy, publisher of the abolitionist periodical, Genius of Universal Emancipation. By 1826 she was regularly contributing poems and essays to the Genius, and Lundy then hired her to edit its Ladies’ Repository section in which Chandler regularly promoted the immediate emancipation of slaves. She did not live long enough to see the end of slavery in the United States. Elizabeth Chandler died of a fever in 1834.